Here’s a challenge for you. Do you know what these events all have in common? The first meeting of the revived and revised University City Community Association? The first community Association officers elected? The first set of light pole street banners to beautify Governor, Regents and Genesee? The first team of newsletter delivery volunteers established? The year was 2002 and great things were happening in University City! In February, the Community Association first adopted the name University City Community Association. The founding officers were Sandy Lippe, Carole Pietras, MaryAnn Guerra, Sandy Finch, Melodie Hallet, Dayna Hydrick, Darlene Ventimiglia, and Linda Canada. In May, the first set of Community Association goals were published in the first newsletter. The theme of the first set of light pole street banners was “University City, more than a neighborhood”. The banner theme was shaped by the Community Association’s goals to promote civic and social activities, enhance communication among neighbors, provide a forum where residents can express themselves, and to help ensure protection of life and property in the community. The first newsletter advertiser was Tom Ventimiglia who made a generous donation to help defray the cost of the newsletter. The first team of volunteers helped to deliver it door-to-door to University City residents. Yes, 2002 was a year of many firsts. The current UCCA officers, board and members salute and thank the many caring and dedicated volunteers who worked so diligently to revive UCCA and set the foundation for the Association to continue to grow and thrive for fifteen years and counting. 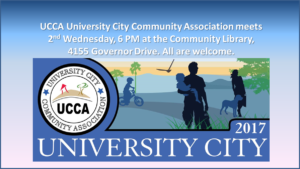 The next meeting of the University City Community Association will be Wednesday, May 10, at 6 PM, at the Community Library at 4155 Governor Drive.